Between 1964 and 1974, William Klein produced an exceptional documentary on boxer Muhammad Ali, Ali the Greatest. In September 2010, he revisited his film by taking screen grabs and then painting them as he did with his painted contact sheets. The striking results were presented to the public for the first time at Polka gallery. In this unique work, the photographer’s innovative perspective meets the athlete’s smart cheek. 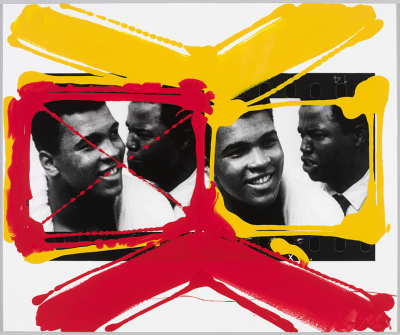 In the exhibition Ali+Klein Film Peint, these works are accompanied by several oversized black and white prints of the iconic Kinshasa fight. Photographer, painter, filmmaker and graphic designer: William Klein is a consummate artist whose work has left its mark on the history of photography. Born in New York in 1928, he discovered Europe during his mandatory military service. He studied at La Sorbonne and under the painte, Fernand Léger. Back in New York, he worked for Vogue and, for his first book photographed the American city in the chaotic and disorderly manner that would become his signature.